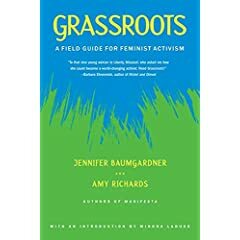 Today I read "Grassroots - a field guide for feminist activism" by Jennifer Baumgardner & Amy Richards. It's a DIY feminist activism book that gives examples of how everyday women can perform activist activities without having to be too radical. Examples are from high school, university students, women at work and in their local communities. Baumgardner and Richards speak about and provide contact details for many organisations performing and supporting feminist activism projects. I've included some links in the feminism and activism links on this site if you are interested in finding out more, otherwise track down the book from your local bookstore..